If you still use a 1st generation iPod Nano, Apple recommends you stop using it right away. There is a slight chance you might have a unit with a defective battery which may cause it to overheat. This problem affects some Nanos sold between September 2005 and December 2006, and although chances are slim this will be a serious problem - the fact that we're talking about 5y old batteries make it a lot more likely to occur. 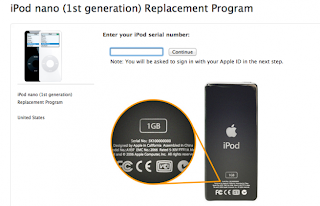 If you have such a device, you better check Apple's exchange program to see if you have a affected iPod Nano and receive a replacement for free.